Sound recording is becoming increasingly popular among birders. Surely, the popular books and CD’s of The Sound Approach have made bird sounds more understandable and more appreciated, but most birders want to make sound recordings for ‘record shots’. Many rarities are safely clinched on sound recordings and for some species sound recordings are even essential for safe identification in some situations (eg subalpine warblers, flyby Olive-backed Pipits and Southern Yellow Wagtail). A while ago, I decided that I wanted to step up my gear. From 2010 I recorded with a nice set of a Sony PCM-M10 recorder in combination with a Sennheiser ME66 microphone. And although this set was good and I had great recordings, I simply wanted more. In my opinion, the power of great sound recordings is 1) that you record the finest sounds in stunning detail and 2) that the recording can give the impression you are ín the recording. For the first point you’ll need a parabolic dish and for the second you’ll need a stereo microphone. Step up for a stereo parabolic microphone it was. If you say parabolic microphones, Telinga is the name that comes to mind. Telinga has a great reputation for excellent quality gear and many professional recordists swear by it. Although a full set (stereo microphone, mounting kit, dish and windshield) will cost you more than 800,- Euro, it will probably be worth it. I was about to order this set when a befriended sound recordist tipped me about a new player on the field: Dodotronic (http://www.dodotronic.com/hi-sound-stereo). These Italian manufacturers apparently use the same microphones as the Telinga set, but in a different set-up, which gives an alleged signal gain of 6dB. Important note: it would cost me around 500,- Euro for the same set. In most cases I go for the safer option and trust on the reputation of Telinga, but Dodotronic was much cheaper on the same set and Telinga did not respond for a month on my repeated questions, which apparently is not new for Telinga. So I went for the set from Dodotronic. The communication with Dodotronic went smoothly and when the gear was ready, it was immediately sent off for delivery. Unfortunately it had to wait for some time because the factory where the microphones are built was not running. Nothing Dodotronic could change. As it was the first time I started recording with a parabolic dish, I was astounded by the gain you get from that piece of plastic. A comparison with my mono Sennheiser ME66 focussed stereo recording was breathtaking. Suddenly, recordings were not flat or hollow anymore, but ‘alive and kicking’. 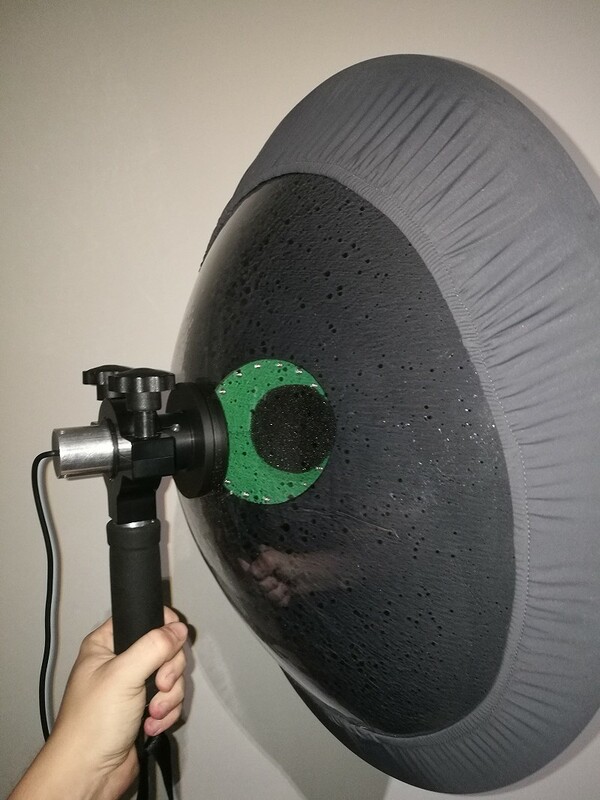 Stereo recording with a parabolic dish is possible when the sound from the left is ‘separated’ by the sound coming from the right with a paddle. The focussed sound is as loud from the left as from the right and thus appears mono, while all the surrounding sounds are more or less in stereo. Especially when using headphones when listening to the recordings, closing your eyes can really give you the impression of being there at the time of the recording. I have no real experience in using other parabolic set-ups, so I cannot make any hard judgements on the quality. But I must say that the recordings are not really short of the recordings made with Telinga gear. But more on the set itself: the microphones are mounted on a paddle that looks a bit like a computer chip. The microphones itself are covered by foam which suppresses noise, and although looks may be deceiving, it does its job. The paddle is mounted in a solid aluminium tube (which looks indestructible) and provided with a mini jack cable. As with all connections with cables, this is a weak spot. How many phone chargers I have lost because of this... In newer versions, this connection is strengthened, but it will always be a weak spot. The paddle is to be slided in a handle which can be firmly fixed with two robust screws. The handle also has two rings with which the parabolic dish is fixed. An inner ring on the microphone side and an outer ring on the handle side. In my opinion this was the weakest part of the whole set-up (I had an old version. I sent my gear back for some repairs, including the rings, and they were swiftly replaced with the new, much better, gear.). With the least amount of wind or pressure, the rings were out of place and the dish could move freely with corresponding sound effects... Putting the rings back in place is no big deal, but it should not be needed. The rings have been much improved (made bigger, more robust) in a recent upgrade of the set and will now be on all sets. The handle is covered by foam to prevent handling noise. Additionally, I’ve purchased the wind screen, which is nothing more than a piece of cloth with an elastic border, so that it stays on the dish, but again it does its job excellent (as does the Telinga wind screen, for x fold the price). My personal experience is that recording is possible with up to ~2bft extra wíth the screen than without. For the dish, one can choose for a foldable version or a non-foldable version. The foldable version is of course much more robust against rough handling, but leaving the dish folded for a longer period is not advisable, but this is the same for the Telinga set. Folding the dish with the microphones attached is not possible, because of the aforementioned rings. Because the foldable dish is not that much foldable, and big and clumsy all the same, it is a hassle to transport it. The looks I had when boarding planes.. Or anywhere for that matter.. I’ve attached an wearing belt to the set, so that I have my hands free when birding/walking/cycling. This is rather ideal, but keep in mind that although the set may only weighs ~one kg, the wind has considerable traction on the dish. I’ve been informed that Dodotronic is also thinking of making their own wearing belt. Figure 1: The setup showing the length of the cable (long enough) and how the belt can be attached to the setup (Thijs Fijen). I also have general comments on recording with a parabolic dish (or external microphone), regardless of which brand. Regardless of where you are, and if you are recording or not, people will stare, say ‘funny’ things or even ask to make pictures of it (Seriously! Some Chinese guy in Thailand..). Anyone who only occasionally makes recordings, and only wants to make record shots, should NOT purchase a parabolic dish. I’ll predict that you start leaving the damn thing in your car or even at home. The same accounts for birders that like to make pictures of birds: choose between photography and recording. You’ll need two hands for recording with an external mic (parabolic or not), and you occasionally want to see the bird.. If you want to have both (for record shots), stick to a handheld recorder (see below). Figure 2: Side view of the setup, the baffle on the 'chip' filters some wind noise. Good to see here that the cable is protruding the handle and is therefore quite vulnerable (Thijs Fijen). 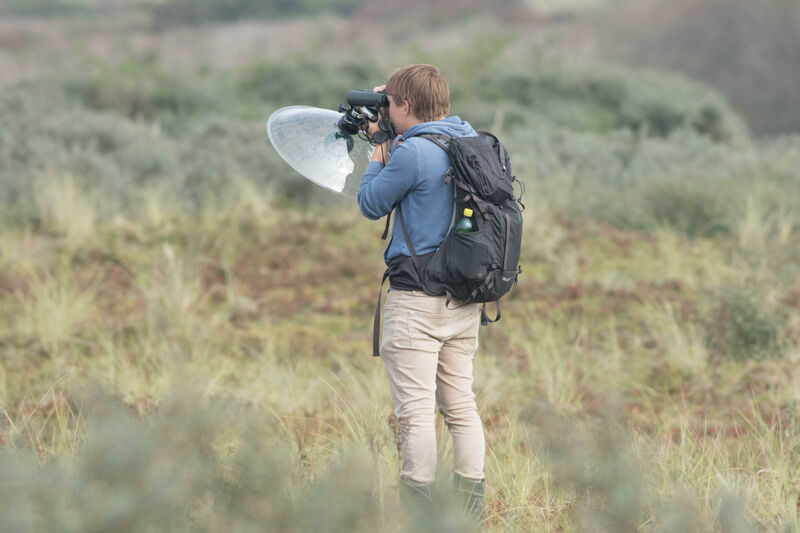 Although I am very content with the way I’ve heard Moustached Warbler last year with the aid of a parabolic dish and headphones, I prefer using the set without headphones for several reasons. One thing is that headphones introduce an extra wire in which your bins can get wrangled when you finally see that bird. Another thing is that a parabolic dish focusses sound coming from the focussed region. And while you can hear that region really well, other regions are extremely badly covered. So, a Yellow-browed Warbler calling behind you is rather easily missed. Lastly, ALL sounds are more loud. While a parabolic dish filters low noise because of the low frequency (which is not picked up by the dish), wind, cars, planes and other noisy things are very loud when using headphones with a parabolic dish. Let alone a breaking branch or other sudden sounds. I only use headphones in certain cases: ‘Moustached Warblers’ and on migration posts, listening for the rarer birds. But again, do note that seeing birds through your bins is hardly possible then. Don’t get me wrong, a parabolic dish is fantastic and recordings are breath taking, but it sometimes comes with a price (not seeing the bird, carrying a big, clumsy thing all day). Several hand held sound recorders exist. And although I only have experience with a few of them. I will discuss here what I advise people when they ask me what to buy. In my opinion, three points are important for recording bird sounds (record shots or excellent shots): 1. Sound quality, 2. Pre-recording and 3. Battery endurance. (1) The sound quality has two components: internal microphones really only matters when you are not using an external microphone, but for record shots (hand held only), this is important. The other component is how the recording is saved: make sure that you are able to record in 96kHz-24bit, because this will make the difference between a Little Bunting and a Rustic Bunting. (2) Pre-recording is sort of a buffer: when on, the recorder automatically saves the last X seconds when pressing record, instead of starting to record when pressing record. This feature is helpful in two ways: you don’t have either endless long recordings waiting for the bird to sing or call, and you almost never have a recording where the beginning of the song/call is missing. What was that? Record, stop, listen: ah, Linnet (instead of all the birds imaginable you thought you heard when it was actually a Linnet..). (3) Pre-recording uses battery, of course. And you don’t want to carry a hefty bag of batteries with you in the field. So, battery endurance is essential. Unfortunately there were two favourite recorders available: Olympus LS-11 and the Sony PCM-M10. Both are currently out of stock and are not coming back. I managed to get hold of another Sony PCM-M10 as a spare recorder, and that recorder was the only one with decent pre-record (5 seconds). At the moment the Olympus LS-12 should be good (pre-record) and with fairly good battery endurance. The Olympus LS-14 should have been an improvement of the LS-12, but is not for birders, because it uses an additional microphone for low sounds (so more noise..). There are some other options that are worth exploring, including the bigger Marrantz recorders, or the ZOOM H5 recorders. Unfortunately I have no experience with them. Figure 3: It is possible to watch birds while carrying the dish, but it is very likely to be a bit of a nuisance (Pieter van Veelen). To answer the question: which parabolic set do I need to buy when I want one? Dodotronic is in my opinion an excellent competitor to Telinga. Most importantly, it is cheaper. This is also a bit the weaker point (I think), because it looks like the set is not yet fully developed. So if money is an issue and you just want a nice set: choose Dodotronic. If you want more certainty and are willing to pay brand premium: choose Telinga. But the ratio price-quality is better for Dodotronic. For even 60,- Euro less, you can buy the mono-set, which is as good (I’ve tested it), but of course misses the stereo experience. Most of my better recordings are on Xeno-Canto and almost all of them are made with the parabolic dish (from August 2015 onwards. So do have a look and listen there. Special attention to these Eider males. Thjis has got a very old version of the parabolic Hi Sound. Now all the problem are solved in the new release. Frst of all an important considerazion: the microphone back must be inline with the handle else the sensor are not on the focus of the dish: the metal of the microphone must not protrude from the back of the handle. - the handle is improved. 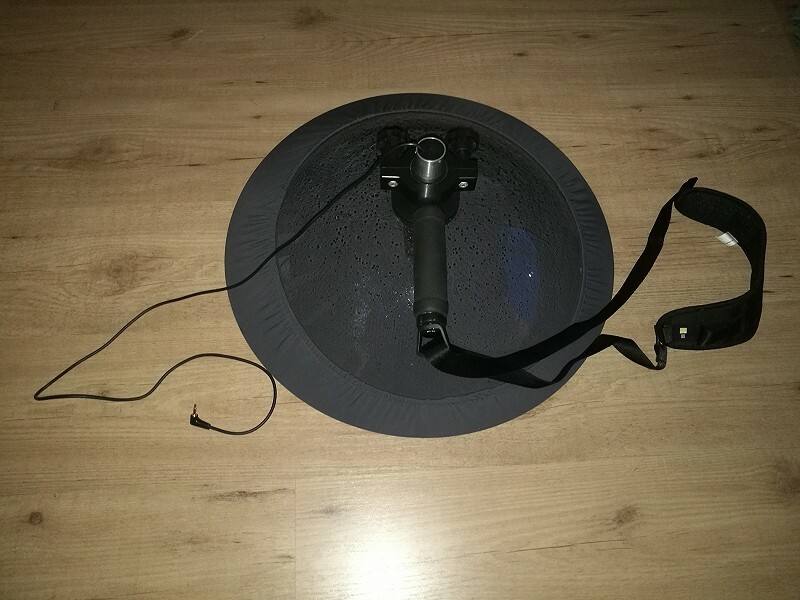 - the ring that fixes the dish is now thicker so the stability problem is solved Moreover the withscreen is a lycra tissue and it's almost completely transparent to the sound. Dat plaatje is super stevig. Geen enkel probleem om hem daarop te leggen. Je kan em bij langer vervoer ook weer naar achteren schuiven, 10 seconden werk. Bedankt Thijs. Ik zie nu dat de huidige Telingas ook gevoed worden vanuit de recorder. De voeding van de Dodotronic parabool gebeurt adhv je recorder (phantom power dus, geloof ik). Er zitten geen batterijen in en er is geen aan/uit switch. Ik heb niet het idee dat het belachelijk veel batterij kost. Een microfoon gebruikt zelf nauwelijks stroom. Ondertussen ben ik nog te weten gekomen dat ik mijn microfoon verder naar voren moet schuiven. Daardoor steekt de microfoon iets uit ten opzichte van de paraboolrand. Dan heb ik nog nieuwe info over de Olympus LS-14: daar kun je de 3e microfoon uit zetten en dan is hij net zo goed als de LS-12, maar weliswaar met een iets grotere opslagcapaciteit. Ha Thijs, hoe zit het bij dodotronic met de voeding? En herinner ik me goed dat er geen aan/uit switch op zit (m.a.w., hij neemt continue op)? Over beide dingen hebben we het volgens mij wel eens gehad, maar ik kan me niet meer herinneren hoe het zat. Leuk stuk, Thijs. Dankjewel voor het delen van je ervaringen. Ik blijf toch gewoon nog even bij alleen mn recordertje.